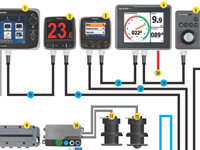 Raymarine’s proprietary cable system for use in NMEA 2000 networks. The design provides two advantages. First, the connector collars are retained on the product which allows for a smaller cable diameter making installations easier. More importantly, the cable can include a sixth wire which allows for backward compatibility with SeaTalk1 equipment. Products with SeaTalkng connectors can be used on NMEA 2000 networks that use Devicenet cabling through simple connector adaptors and conversely equipment with Devicenet connectors can be used on NMEA 2000 networks that use SeaTalkngcabling through simple connector adaptors.